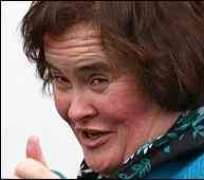 Britain's Got Talent star Susan Boyle has signed a deal to write her autobiography, it has been announced. The book will document her rapid rise to fame, after her performance of I Dreamed A Dream on the ITV show was watched by millions on YouTube. “I'm writing this book to try to show that you shouldn't judge a book by its cover and I hope it will benefit other people,” the 49-year-old said. The book, The Woman I Was Born To Be, will be published in the autumn. “When I strutted on to the stage for that audition, I was a scared wee lassie, still grieving for my mother, not caring how I looked,” Boyle said. “I think I've grown up a lot in the last year, become more of a lady, and I'm not so frightened any more. Boyle was beaten in the Britain's Got Talent final by dance troupe Diversity, but has gone on to become a global phenomenon. Hollywood actress Demi Moore revealed on micro-blogging site Twitter that she was a huge fan and Boyle was asked to appear on Oprah Winfrey's talk show. Her debut album topped the chart in the UK and the US. However, intense media interest and the pressure to perform led to Boyle – who comes from a small town in west Lothian, Scotland – being admitted to The Priory Clinic in London with exhaustion. Simon Cowell, who has been helping to guide Boyle's career, was criticised for not doing enough to protect her from the press.